Guiding – as it is commonly understood – is not about creating; it’s about helping. The guide has no goal other than to lead someone safely to the destiny of their choice. The guide is skilled; he or she actually can lead the way, but does so without ambition beyond delivering quality service. The guide sells safety where risk is involved. 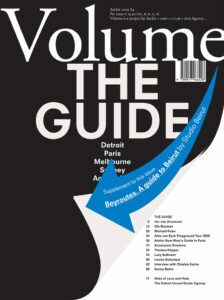 With The Guide, Volume presents a diverse collection of guides and attempts to guide. From strange maps, bike tours and magnetic navigation belts to the conception of Paris’ 13th arrondissement as a series of islands; here, the guide is understood as not simply a service or selling point, but as an exploratory tool, a generator for a proactive engagement with the city. As a supplement to this issue of Volume, we also present the separate publication Beyroutes, a guidebook to Beirut, one of the grand capitals of the Middle East. Sorry, this issue is sold out!